This is one the most common shrimps in the aquarium trade. In their natural habitat (several tropical seas), the barber shrimps live in couples and serve as cleaners, especially for angelfish (Pomacanthids). They abandon this role, totally or partially, in an aquarium if they are well fed. Like many shrimps, they pick up the food rejected or ignored by fish. The male searches for food and gives it to the female. It is best to keep a couple in a tank and provide them with hiding places, where they will take refuge by day, as they are most active in the dark. 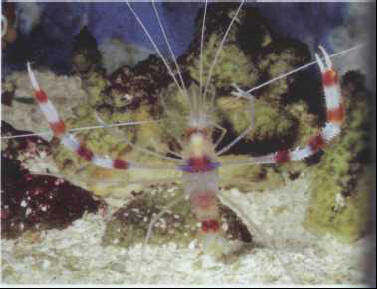 In good conditions, this shrimp molts several times in a year, particularly if it is well fed. Size: 7-8 cm. ЗЛЫНКА , город (с 1925) в Российской Федерации, Брянская обл., близ ж.-д. ст. Злынка. 5,2 тыс. жителей (1992). Деревообрабатывающая, плодоовощеконсервная промышленность.